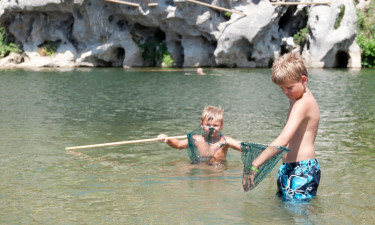 Le Ranc Davaine is a luxury camping site that is situated that can be found along the bank of the Ardeche River. 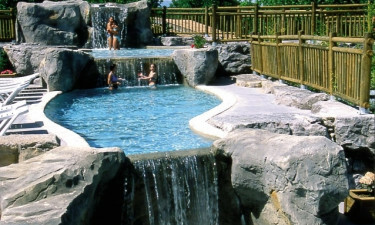 This is the perfect place to practice a wide range of aquatic activities, while people who book a mobile home at Le Ranc Davaine will also find picturesque forests and other enchanting natural areas right on the doorstep. People who simply want to unwind in style while enjoying the camping holiday of a lifetime will also find everything they need right on the site. What Makes Le Ranc Davaine So Special? The Ardecehe River is the perfect place to simply unwind and soak up the atmosphere and keen fishermen will really be in their element. The gently flowing waters here are particularly cool and clear and this is a good place to try canoeing or simply take a dip, while Le Ranc Davaine also boasts its own large swimming pool complex. The LUX-Camp also provides a large range of sports and other types of activities for guests to enjoy right onsite. Guests are given full use of the volleyball court and large lawn where they can play football, boules or other types of sports and equipment is available for hire if required. Fitness classes are also held here during the daytime and taking part in these fitness classes is the ideal family bonding experience. 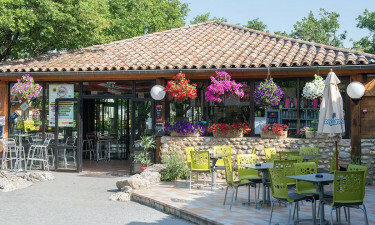 Le Ranc Davaine is the perfect base to use while exploring the surrounding area. Lovers of natural beauty will find several caves that are just waiting to be explored as well as hiking trails that take them deep into the forest to spot a range of flora and fauna. A number of charming French villages can also be found nearby and guests can hire a bicycle to spend the day cycling along winding lanes to villages and towns such as Vogue, Ruous and beautiful Balazuc. Indulging in a freshly prepared meal at the restaurant is the perfect way to get the evening off to a stylish start. An enchanting evening entertainment programme is provided for guests every night of the week to ensure that there is never a dull moment during the luxury camping experience. among the types of entertainment that are provided are magic, caberet, live music and dancing and these shows are suitable for families, while a disco is provided for adults who want to drink and dance the night away. Before heading out to explore the area surrounding Le Ranc Davaine, guests will want to put together a picnic. Freshly baked bread and other goodies can be purchased at the onsite supermarket, while the nearby snack bar serves a good selection of items that can be taken away to munch while sitting beside the river. The campsite has introduced a cashless bracelet system. On arrival you will receive a bracelet which you can use to put money on. With this bracelet (or by credit card) you can do all payments on the campsite.